Did you know that your eyes are the most complex organs in your body, besides your brain? Composed of more than 2 million working parts, your eyes can focus on 50 different things per second and process 36-thousand bits of information every hour! 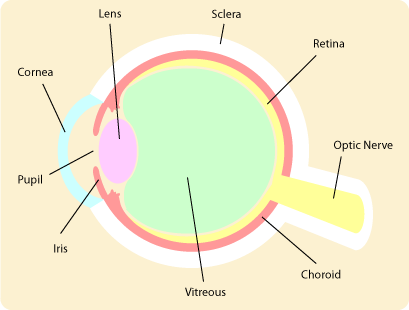 Cornea - The front part of the eye that is responsible for most of the focusing or bending of light for the eye. Iris - The colored part of the eye. It is positioned behind the cornea but in front of the lens of the eye. Pupil - The black spot or hole in the iris. It is the aperture of the eye. Lens - The middle part of the eye that allows the eye to change focus from distance to near. Vitreous - The jell-like substance that allows nutrients and oxygen to pass through to tissues without the use of blood vessels while maintaining a clear path for light to shine onto the Retina. Retina - The nerve part of the eye that translates light into an electrical impulse that the brain can understand. Astigmatism - A term that describes the shape of the cornea. It is not a degeneration or disease of the eye. It simply means that the curvature of the cornea is not round like a basketball but more like a football.